by Mischa Wilmers. Wilmers is an independent journalist based in Manchester covering social justice and international affairs. He has reported from the UK and South America for the Guardian, the Independent, New Internationalist, Deutsche Welle, Huffington Post, Equal Times, the Big Issue in the North, and the Santiago Times. 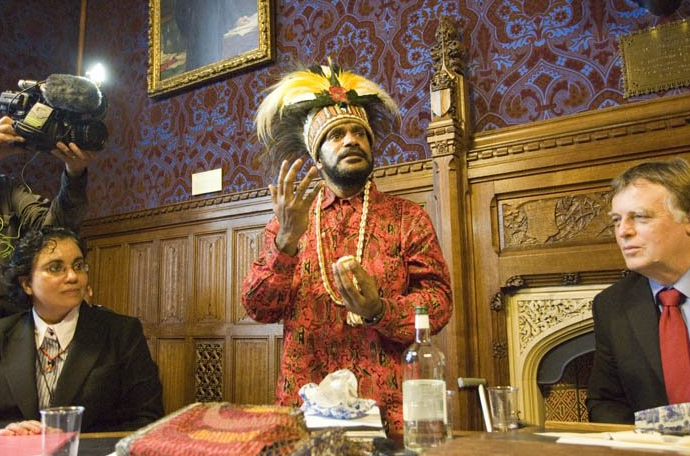 Benny Wenda is speaking to some British parliamentarian in October 2008. In episode 46 of Sea Control, Natalie Sambhi from the Australian Strategic Policy Institute talked with Dr. Peter McCawley and Dr. Ross Tapsell, both from the Australian College of Asia and the Pacific. In general 3rd Indonesian presidential election, held on July 9, shows a positive development in Indonesia. Nevertheless, Indonesia has still a long way to go. For example, as Indonesians prepared to vote for a new president, dozens of West Papuan activists were reportedly attacked by security forces for urging local people to boycott the elections. Mischa Wilmers speaks to the exiled leader of the Free West Papua movement, Benny Wenda, about his lifelong struggle for justice and asks why nobody is talking about the territory he calls “little South Africa”. If someone were to describe a brutal military occupation of a region whose people are routinely attacked for demanding their right to self-determination, it’s unlikely Indonesia would spring to mind as the oppressor. The western media continuously fawns over the progress made by the world’s “third largest democracy” since the fall of the Suharto dictatorship 16 years ago, the dominant narrative being that expressed by David Cameron when he visited the country in 2012. “Indonesia has transformed itself in the past decade into one of the world’s most important democracies, with a free media and elections,” he declared. “The military no longer plays a role in politics, but fulfils its proper role defending the country from external attack.” (see also David Mepham, UK Director of Human Rights Watch, “Letter to Prime Minister David Cameron on Indonesia”, 18.04.2012). In his speech Cameron announced plans for Britain to break its arms embargo with Indonesia, imposed by Labour in 1998 following the revelation that British-built Hawk aircraft had been used by Suharto to slaughter the people of East Timor. The following day BAE Systems and other arms companies began trading with the country for the first time in over a decade. To many West Papuans, however, the description of Indonesia as a responsible democracy with a benign military is wildly inaccurate. Last month, as 180 million Indonesians prepared to participate in the country’s presidential elections, dozens of activists in West Papua were reportedly arrested and beaten by security forces for handing out flyers urging local people not to vote. Despite the threat of violence the West Papua National Committee (KNPB) estimated that around 80% of eligible West Papuan voters chose to observe a peaceful boycott. All of this went virtually unreported in the international press. This file photo shows a West Papuan separatist carrying the banned Morning Star flag as he walks past a line of Indonesian riot police officers surrounding a pro-independence celebration in Jayapura, Irian Jaya. Benny Wenda, the exiled leader of the Free West Papua movement, was among those leading calls for the boycott. Granted asylum in the UK in 2003 after being persecuted by the Indonesian authorities, he lives in Oxford but retains close contact with friends and family who constantly update him with news from the region. “My people are living in a prison and are discriminated against in many forms,” he protests, though the latest attacks are nothing new to Wenda who has been struggling to bring similar incidents to the attention of western governments for more than a decade. A search of the BBC website reveals just two articles referring to him – an indication of the lack of mainstream media interest in a region many in Britain have little or no knowledge of. Yet his remarkable life story is worthy of far greater attention than it has received, serving as a poignant reminder of a forgotten colonial struggle spanning several decades of western backed exploitation and slaughter. He was born in the West Papuan highlands in the 1970s, several years after the “Act of Free Choice” – a vote to decide whether West Papua should relinquish its sovereignty – led to the annexation of the region by Suharto’s Indonesia. Despite the massacres that ensued, Wenda has fond memories of his early life in the highlands. “When I was a little boy I would play in the forest and help my mum in the garden. I didn’t have any fear, surrounded by nature,” he says, describing his short lived experience of childhood innocence. 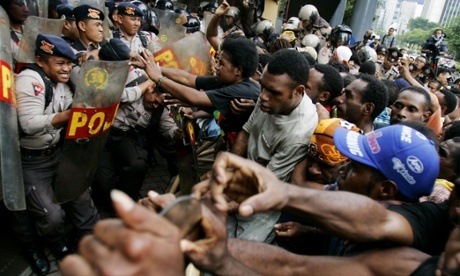 About 200 Papuan activists clash with police guarding a building housing the office of U.S. Mining giant Freeport-McMoRan Copper and Gold Inc. in February 2006 in Jakarta, Indonesia. Many claim that the company has not brought any benefits to local residents during its 40 years of operations in West Papua (Photo: Ed Wray). His search began in the university library in Jayapura where he quickly found that books on West Papua were heavily censored. Then, in 1999 a German student with an interest in indigenous cultures introduced him to the internet. Online he discovered that West Papua had been a Dutch colony until 1962 when control of the region was temporarily transferred to the UN. He read accounts describing how the Dutch had previously prepared West Papuans for independence and how in 1961 his forefathers had raised the Morning Star flag and sung the national anthem in anticipation of their sovereignty. But the celebrations were premature. Eight years later the UN turned a blind eye as Suharto moved in and held a sham referendum in which 1,022 tribal elders were selected by special forces and coerced at gunpoint into voting for an Indonesian takeover. A month before the vote, Frank Galbraith, the American ambassador in Jakarta, wrote in a secret memo: “possibly 85 to 90% [of West Papuans] are in sympathy with the Free Papua cause.” The “Act of Free Choice” had in fact been an act of no choice. What followed was the genocide Wenda witnessed as a child. It became apparent that over a period of three decades thousands of West Papuans had been massacred by Indonesia for the purpose of acquiring the region’s natural resources – including the world’s largest goldmine and third largest copper mine – all with the full support of Britain and the US. Armed with this knowledge he vowed to dedicate the rest of his life to liberating his people from colonial rule. 15 years on he remains true to his word. Last year he was nominated for the Nobel Peace Prize and although he is unable to return to his homeland he has become a global symbol of the West Papuan cause – much to the chagrin of Indonesia’s ruling elites who launched an unsuccessful international arrest warrant for him in 2011. He has created a base for the Free West Papua movement in Oxford and has just opened a new office in Melbourne where he hopes to establish a strong presence despite Prime Minister Tony Abbott declaring that West Papuan activists are “not welcome” in Australia. Though the Suharto dictatorship which bombed Wenda’s village is gone, the current regime faces similar charges of exploiting the region for economic gain at the expense of West Papuans. According to the World Bank, Papua province’s regional GDP is 50% higher than the national average while the people living there are among the poorest in all of Oceania. Around 30% of West Papuans live in poverty – nearly triple Indonesia’s national average of 12%. The Grasberg Mine, located near Puncak Jaya in West Papua, is the largest gold mine and the third largest copper mine in the world (Photo: Kadir Jaelani). Those who complain are dealt with harshly by security forces. In its latest annual World Report, Human Rights Watch states that violence and fatal attacks on protestors are commonplace and claims that 55 activists are presently incarcerated for their peaceful involvement in the independence movement. In July five political prisoners were released after serving three-year sentences in a Jayapura prison. Their only crime had been to read out a “declaration of independence” from Indonesia at a rally in 2011. But these stories rarely make it outside of West Papua – a situation which is not helped by the fact that foreign journalists are heavily restricted from entering the territory. Indonesia’s newly elected president, Joko Widodo, spoke in support of indigenous peoples in the lead up to the general election. But Wenda’s central demand is for Indonesia to respect West Papua’s right to self determination under international law. He argues that the only basis for Indonesia’s claim to the territory, the “Act of Free Choice,” has been thoroughly discredited and that his people must be permitted to determine their own future with a new, fair referendum. Indonesia continues to resist these demands while the UN remains silent despite urgent calls from human rights groups for a Special Representative to investigate the situation. While the “international community” continues to ignore Indonesia’s abuses there is no doubting the magnitude of the task ahead for the Free West Papua movement. Yet Wenda appears remarkably positive, drawing inspiration from the likes of Gandhi and Mandela and from the experience of East Timor which obtained independence from Indonesia in 1999 – though not before a third of the population had been slaughtered. The challenge is to capture the attention of the world before it’s too late. This entry was posted in English, Indonesia, Mischa Wilmers, Politics in General, Security Policy. Mischa you have read about the United Nations trusteeship of West Papua, and about our legal obligations under article 76 of the UN Charter to “promote” the “self-government or independence” of West Papua; why don’t you write a Special Report on that?